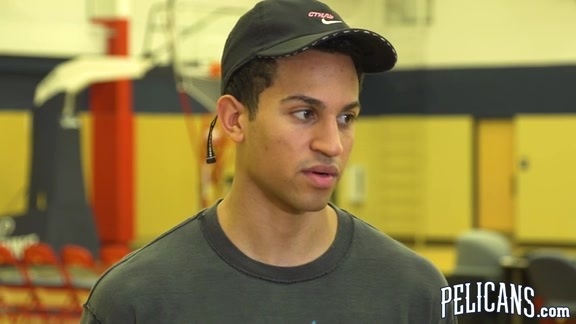 New Orleans 2017 second-round draft addition Frank Jackson has dealt with periodic adversity in various forms during his basketball career, but what he went through in 2017-18 was a brand-new experience. The Duke University product had never missed significant time while playing hoops in high school or college, but was forced to sit out all of what would’ve been his rookie NBA campaign, due to a right foot injury. After what was essentially a “redshirt” year, when Jackson joins the summer league Pelicans in practices this week at the Ochsner Sports Performance Center, it will be the first opportunity for New Orleans media and fans to glimpse what the 20-year-old combo guard might be capable of at the pro level. Intangibles-wise, the Duke University player received off-the-charts grades from NBA teams a year ago, which partly resulted in him being the first draft pick of Round 2. That’s one trait Jackson hopes to demonstrate in Las Vegas, where he’ll join two-year Pelicans veteran forward Cheick Diallo, as well as 2018 Pelicans second-round pick Tony Carr, as the most prominent faces on New Orleans’ roster. Jackson’s NBA career may be starting a year later than expected, but he’s not behind schedule when it comes to what he envisioned as a young player. After enrolling at Duke, Jackson was far from a lock to be a one-and-done collegian, taking a wait-and-see approach to his decision on declaring for the draft. He averaged 10.9 points as a freshman for a Duke team that went 28-9. “To be honest, I had no idea,” Jackson said of how long he projected it to be before turning pro. “I always thought about (the possibility), but never really knew. I went into the year saying, I’m going to give my max effort, play as hard as I can, and at the end of the day, make a decision. But I never really looked at it like that was the goal (of his freshman season). Like Pelicans teammate Jrue Holiday, Jackson comes from a very successful, closely-bonded family. His father was a state senator in Utah and his parents – who’ve been married for 20-plus years – emphasized education, one reason he chose to attend well-respected Duke. It was an approach that also quickly endeared Jackson to Duke’s coaching staff, which has helped produce countless NBA players over the years. “I loved coaching Frank,” Duke assistant coach Jon Scheyer said. “All of us did. The first thing you noticed about him is he’s an amazing competitor. That’s something you love to see. He competes every day. For obvious reasons, it’s been difficult to pin down specifically what Jackson’s strengths will be as an NBA player, something he’ll begin to show this week, while facing pro competition for the first time. But Scheyer was impressed not only with Jackson’s natural talent, but how he adjusted over the course of the ’16-17 season with the Blue Devils. At 6-foot-4, 202 pounds, Jackson has a sturdy build that should help him defensively in the pros. His shooting numbers at Duke were very good, especially for a backcourt player, including 47.3 percent from the field and 39.5 percent from three-point range. In the final 15 games he played for the Blue Devils that season, his rates in those categories jumped to 49.6 and 42.9, respectively. “Athletically he’s off the charts, with the way he gets to the basket,” Booth said. “He can contort his body and use the rim to finish around the basket. His jump shot is also something that’s a weapon right now, especially off the dribble. I think he has the tools to be a good defender at the NBA level.